From its origin as a small collection of fishermen’s cottages along the seashore to the vibrant town of today, water has always played a central role in the lives of the people of Greystones. Whether for swimming, fishing, sailing, rowing or walking the sea is a well-used and loved resource in our town. While there are no major rivers in the area, there are 2 small streams and with the close proximity to the mountains and larger rivers, the people of Greystones also have access to many inland leisure activities close to rivers. 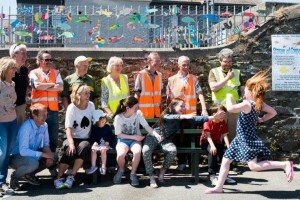 Greystones Tidy Towns has undertaken a project called ‘Stream of Conscience’, to raise awareness of our need to care for this precious resource both as individuals and collectively. 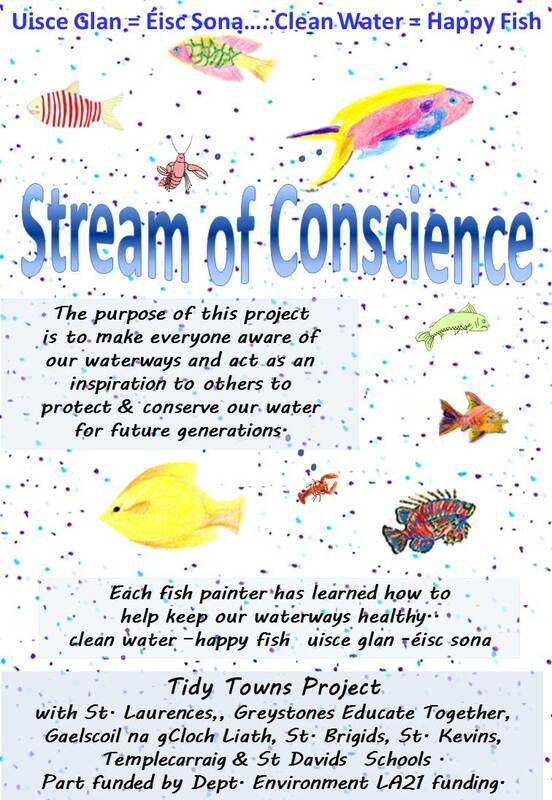 ‘Stream of Conscience’ is an education and community based art project where children learn about the part we all need to take in caring for the precious resource that is water, its habitats and inhabitants. 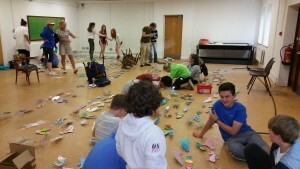 The project had 2 phases. The first phase of the programme was focussed on water pollution and what we all can do to keep our waters clean and this was delivered by the teachers in the six primary schools to 5th and 6th classes. The children then looked at their own activities and see how these can impact on water quality at different stages of the water cycle be it at home or school, in the park, in the countryside, by the sea or along rivers. 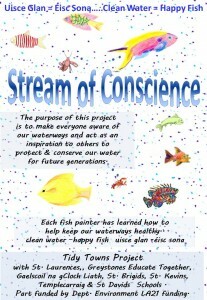 The children identify various actions they each can take to help keep our waterways, rivers and seas clean. Among the action could be, making sure that they take all rubbish home from a day at the beach, not dumping litter down storm drains, cleaning off dinner plates before they are washed, not putting dangerous substances down toilets, sinks or drains, using the brown bin or composting instead of dumping down the sink, and using environmentally friendly detergents and washing-up liquids. Taking these actions, no matter how small, helps to keep our water clean and healthy and highlights to the children the role everyone has to play in keeping and cherishing our environment. The children are encouraged to talk to their parents and other people at home about what actions they can all take as a household to reduce the negative impacts on water quality and encourages them to then act responsibly. The second phase of the project involved each child who took part in the programme designing and painting their own fish. 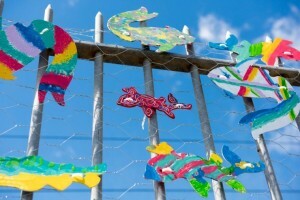 Once the 600 or so fish were all painted Students from Temple Carraig School helped the Tidy Towns volunteers to attach these fish to lengths of wire. 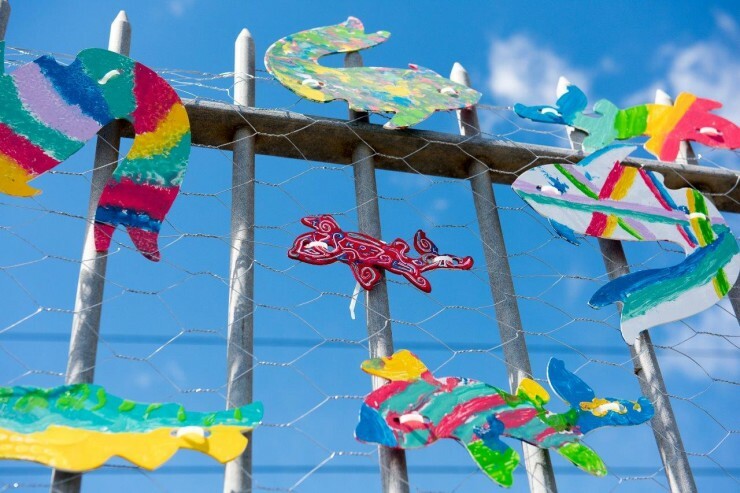 These lengths of wire were then assembled together creating a great vibrant shoal on the railing leading to the South Beach in Greystones where they are on permanent display. Each fish is a reminder to the individual of their role in keeping our waters clean and the strength and power there is in all coming to work together to create the ‘Stream of Conscience’. The shoal of fish in the installation represents the community and illustrates how all are needed to create an exciting and powerful force for change in caring for and valuing water and will be an inspiration to others to become involved. It is hoped that by placing it in such a well-used area that it will invoke questions from children to their parents as to what steps they are taking to help keep the waterways pollution free, and keep our fish happy. Our slogan “Clean Water = Happy Fish” –“Uisce glan = Éisc sona” should appeal to all ages. This project was part funded by Dept of Environment LA21 funding.